This Hub is the second of two discussing the voice-leading patterns one must use in writing second-inversion triads; the first is linked in the sidebar below the picture and to the right, in case you wish consult it before working through this one. 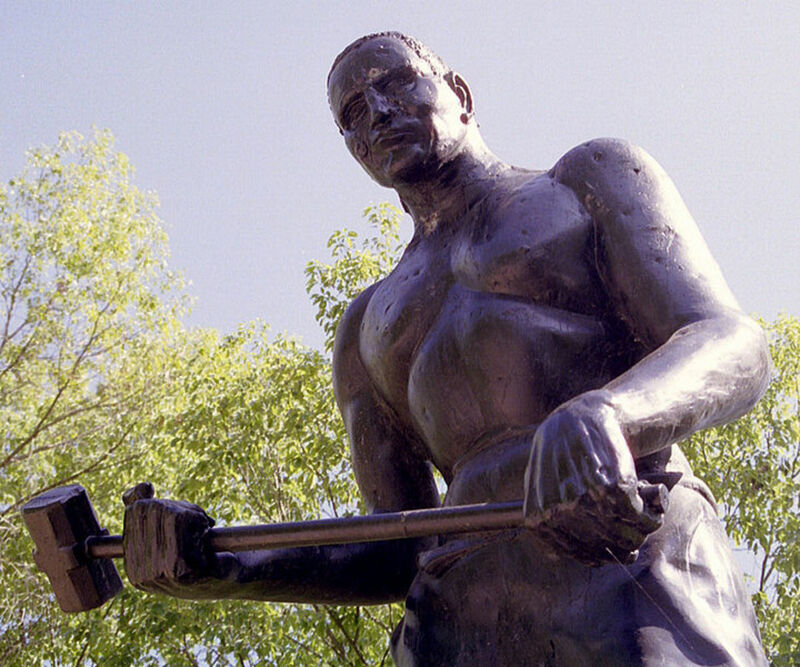 Or you may wish to check out still earlier part-writing Hubs. There are quite a few, and there is a recommended sequence in which to work them. You can see a summary of the first series--it deals with part-writing root position triads---in the sidebar as well; it should help you find the best place for you to start. A similar summary for this series--part-writing inverted triads--will be coming soon. 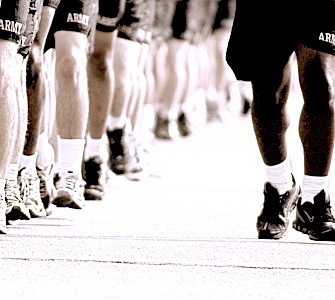 Counting cadence allows marchers to stay in step; musical cadences define phrases, keeping the listener 'in step.' Image courtesy US Army, modified by author. Part-writing second-inversion triads is paradoxically both easier and more 'dangerous' than root-position or first-inversion triads. Find out why here--and learn to navigate the tricks and traps with video examples and interactive practice questions! If you are reading this paragraph, presumably you've decided that right now, this Hub is the one for you. That would imply that you are already familiar with the more straightforward types of sic-four chords we dealt with in Second-Inversion Patterns I: the Alternating/Arpeggio six-fours, and the Neighbor Six-four. In this Hub, we'll explain--and practice!--the very common and useful Passing Six-four, as well as the Cadential Six-four which suggested the signature photo, above. 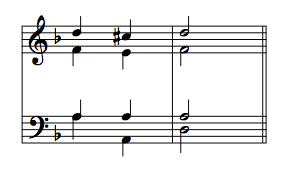 As with the previous Six-four chords, the acceptable ways of using these chords are quite specific. 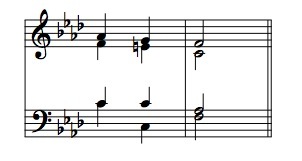 Second-inversion triads cannot be used at random--not, at least, if you wish to stay within the bounds of Classical (or "Common Practice") musical style. Let's begin with the Passing Six-four. Notice, however, that not all voices follow a passing-tone motion. 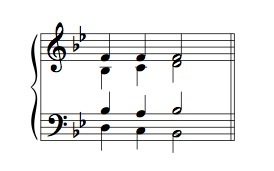 Although one voice--the soprano in this example--moves precisely contrary to the bass, another keeps the common tone, while the remaining voice executes a neighboring pattern! Note that this example differs from Example 1 by a single tone: the F# becomes an F natural. This is enough to provide an unambiguous tonal context to our ears, however; we may not be able to identify or articulate the sound verbally, but we know which sorts of chords are apt to follow it. Try writing a similar prolongation of the dominant using a passing supertonic six-four to harmonize the soprano below. But think carefully about the key and its implications! This question has a built in 'trap' to avoid. In other words, we need to use the melodic minor scale, not the harmonic minor. Of course, this also creates a minor triad on the supertonic, not a diminished one. This is interesting! Here we are forced to use not just the melodic minor to form our chords, but the 'wrong' form of it! 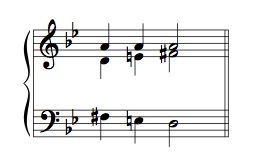 That is, this descending line features the 'ascending' form of the melodic minor scale. But the seeming paradox is a necessity--if we used the tones of the descending form of the melodic minor, we would lose the dominant harmonic function. (Of course, there could be musical contexts in which we wished to do just that for one musical reason or another.) 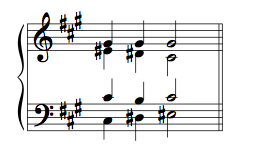 In that case, the voice-leading would be quite similar, but the tones of the descending melodic minor would be used. Other prolongations are also possible. 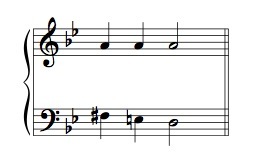 In normal tonal music they are seen much less frequently, since normal harmonies 'polarized' around tonic and dominant functions. One possibility is to prolong the leading tone triad. 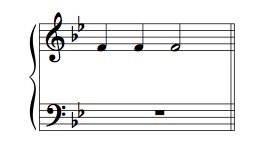 Try doing so, using the following soprano. What passing passing six-four is needed? As shown, the passing chord works out to be IV 6/4, and the chord prolonged is the leading tone triad, viio. The voice-leading patterns of the inner voices are different from what we have seen before because we are following normal doubling practice. Part of the harshness comes from breaking one of our 'rules': one doesn't usually write the leading tone triad in root position. (The same applies to the diminished supertonic triad sometimes found in minor mode.) In the present context, though, the preparation of the dissonant root position by the first inversion, and then followed by the harmonically stronger root position dominant, goes a long way toward justifying the dissonance to our ears. The overall effect of the first complete measure is of a single prolonged dominant harmony--the leading tone triad's function is dominant in any case, and the final dominant triad in the measure comes as a summation of the harmonic meaning of the preceding triads. Here, the root position leading tone triad is replaced by a first inversion dominant triad. 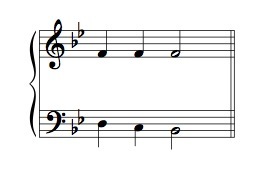 Only a single tone changes, but much of the remaining harshness disappears: we have no root position diminished triad, and the voice leading in the alto is simplified and strengthened. Here we have an example in which the passing six-four connects two different triads, albeit ones expressing the same basic harmonic function. (That is, viio and V are different triads, but both express a dominant harmonic function.) This could occur in other harmonic contexts, too, by connecting other pairs of third-related triads via a passing six-four. 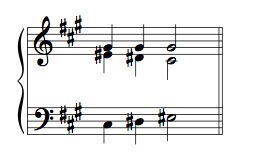 It's easy to see soprano lines similar to the soprano of Example 3 and 3a--for example, measures 1 and 3. 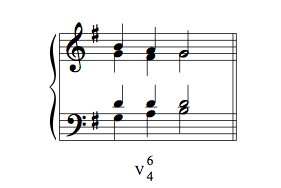 But is there another line, somewhere in the texture of Example 3 or 3a, like the question's soprano in measures 2 or 4? Using Example 3 as a model, try to create a bass line fitting the hints just given. As shown, prolongations of viio, iii, vi, ii and V can be created. 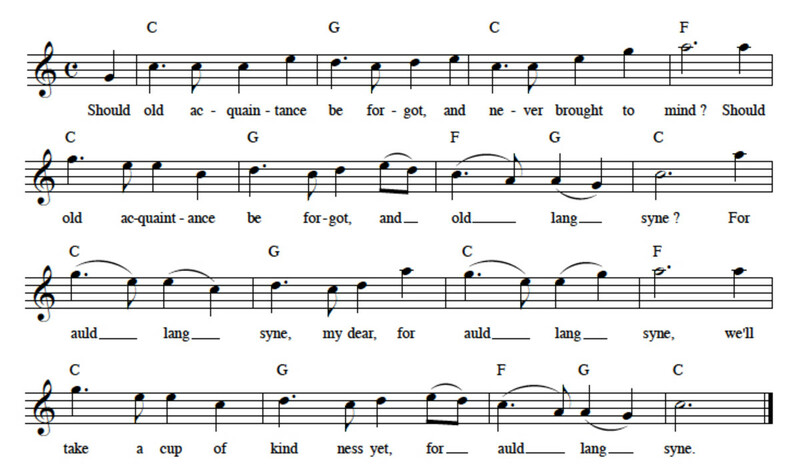 There is also a 'bonus' repetition of the cadential V-I, followed by a repeated tonic. These extend the phrase structure to a 'balanced' eight measures. 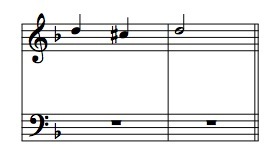 The repetition is a good opportunity to make use of the 'neighbor six-four' as well, as indicated by the figured bass numerals shown. In general in a harmonic sequence--that is, a sequence in which systematic transpositions of all four voices determine the harmonic structure--the details of the voicings remain constant throughout, even where this implies such normally forbidden procedures as doubled leading tones. However, here it is convenient to modify the voice leading a bit, beginning in the fourth complete measure to set up the cadence. Try writing the inner voices according to the hints just given. A rather synthetic, but not unmusical invention!--though no-one will mistake it for great art. Let's move on to our final second inversion idiom. 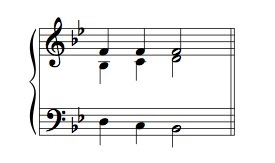 Resolution is just as in the neighbour six-four, however: over a static bass tone, the upper voices fall stepwise. Example 4a illustrates. 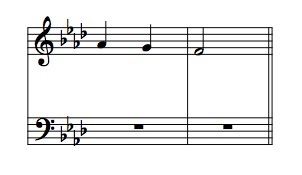 More recently, music theorists influenced by the work of Austrian theorist Heinrich Schenker have correctly pointed out that this chord is really not so independent: the apparent two chords of the idiom, the tonic six-four and the dominant, really constitute a single dominant which is embellished by a linearly-conceived dissonance. 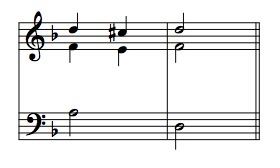 To put it another way, the first of the 'two chords' is really not an independent chord at all, but an appoggiatura--a type of non-chord tone found in accented metric positions, and resolving downward by step. This more recent analytic view seems to be gaining the upper hand over the more traditional 'vertical' view. However, the part-writing remains the same, only the Roman numeral analysis (and the conceptual framing underlying it) differ. 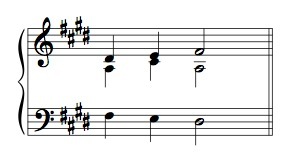 Let's practice writing the cadential six-four in several different keys. The first may challenge you a bit! 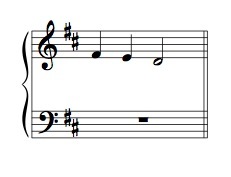 Identify the key as usual, and add an appropriate bass, using Example 4 as a guide. As shown, the key is D minor--the C# is the leading tone, and a very broad hint to the minor key! In Example 4 there is no 1-7-1 line, but you should have no great trouble using our by now long-familiar tactic of exchanging chord tones among voices to understand how such a line can exist within the context of the cadential six-four. Add the appropriate inner voices to your soprano-bass outline, beginning with an open position chord. 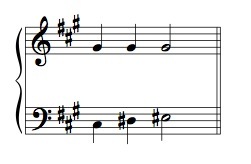 The alto falls naturally into parallel sixths with the soprano, while the tenor doubles the bass tone--doubling the bass of a cadential six-four is an almost invariable practice. The result is a 3-2-3 line. Did you remember the raised leading tone? 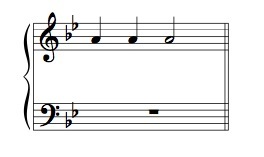 Try harmonizing the melody below, using both a passing and a cadential six-four. Write the bass line first. 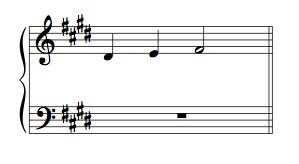 The cadential six-four figure occupies the second measure completely, leaving just four chords to accommodate the passing six-four. The latter pattern must begin either on beat one or two, then, and we know that the second chord--the dissonant six-four--must be on the unaccented beat. Therefore, the passing six-four figure must begin on the first beat of measure one. Now add the inner voices. 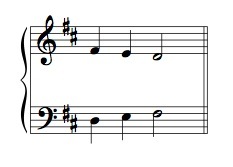 The technically squeamish might shrink from this version, because the usual definition of the part-writing error called "similar octaves" describes this progression exactly: the octave between bass and soprano is reached by similar motion, and the soprano leaps to reach it. 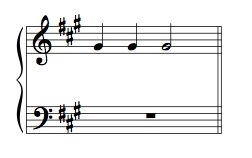 Yet the stepwise motion in the bass and the indirect yet strong linear connection between the soprano's "D" and its initial "C#" go a long way toward justifying the apparent infraction. Adapt the harmonization of Example 6 to the melody shown. Begin with a close position triad to help keep alto and tenor from getting too low. 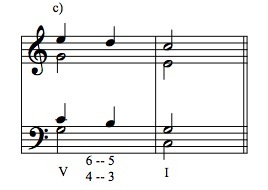 The inner voices almost write themselves: the C natural in the alto on beat four of bar one creates no difficulties because it is not adjacent to any form of scale degree seven. 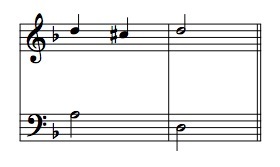 The tenor moves naturally stepwise in its meandering descent from scale degree 5 to scale degree 3. 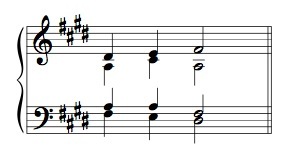 Let's try one last 'summary' example, which will use all of the six-four types explained in this Hub: the arpeggio/alternating type; the neighbor type; the passing type; and finally the cadential. 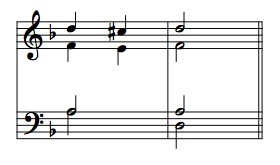 The order in which the six-four chords were given above was the order in which they were presented in this Hub--but it is also a workable order in which to use them to harmonize this melody. 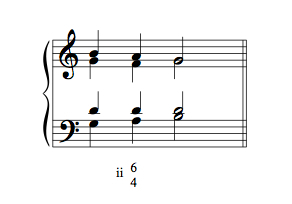 In addition to the appropriate six-four figures, use a first inversion leading tone triad in measure 1, a root position IV chord in measure 2 and a first inversion supertonic in measure 3. Begin, as always, with the bass line. 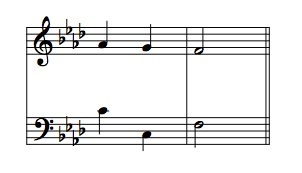 In the first bar, the bass arpeggiation is arranged to avoid doubling the third on beat two, and to stay in the middle of the bass vocal range. 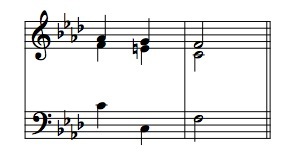 (In a higher key, it would have been tempting to keep the arpeggiation a straight descent, but if we hadn't reversed direction in the arpeggiation, the low Eb would have been difficult to avoid.) From there, the contour of the bass rises to the dominant scale degree at the final cadence, setting up our newly familiar octave drop figure. Now add the inner voices, beginning with an open chord voicing. An alternate (and more casual) place to ask any musical questions that may linger in your mind... plus, musical parlor games! 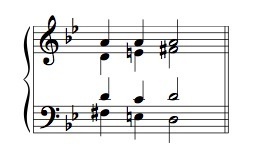 Note the voice exchange between soprano and tenor in the first two beats. Other possibilities are not shown. (How many can you find?) The differences between them are minimal in a piano rendition, but would be clearer (if still quite subtle) in an actual vocal performance. With the 'grand finale' complete, it's time to close this Hub. In doing so, we also close out this series on inverted triads, and mark a big milestone in the history of these part-writing Hubs: we've now covered all diatonic triads, in all inversions. That's big. Of course, there's more. We haven't dealt with chromatic harmonies, or with tonicizations or key changes (partially overlapping categories.) Nor have we dealt with seventh chords. But watch for Hubs on the latter. They are on the way! Part-writing is an essential discipline in really mastering traditional music theory, and triads in inversion add great nuance and musical flexibility to the harmonic palette. This Hub examines triads built on 3rd, 6th, and 7th scale degrees. You are right about the videos--they definitely take some time. (Though less than they used to under the previous OS & software, I'm happy to report.) Glad you noticed! A very detailed guide. I appreciate the time you've put into this one, especially regarding the media. Thank you. Thanks for continuing the long trek towards the mastery of part-writing with me! Hope this Hub helped you to master Passing and Cadential six-fours. Let me know!